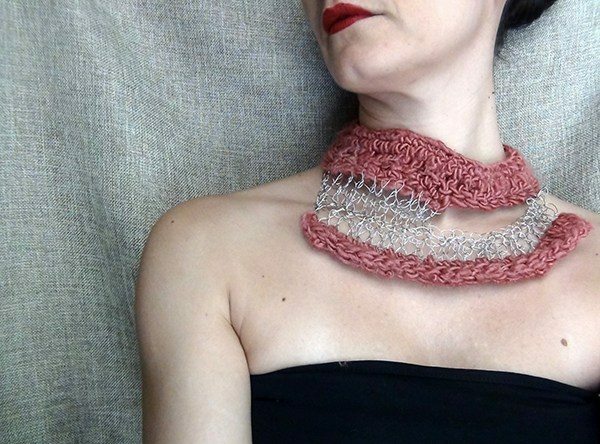 Penny Chorafa of Wearit Crochet is a Greek crochet artist who loves to experiment with both form and material when constructing her crochet jewelry. 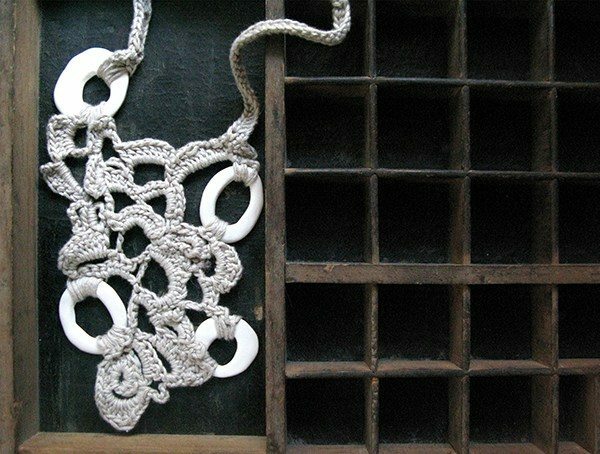 With a background in architecture and an interest in unique fibers like paper yarn, she is able to make original, sculptural wearable art pieces, and is constantly pushing herself to create something new. What first inspired you to learn to crochet? Well, it all started during my maternity period, when I spent a lot of time in the house, taking care two infants. I wanted desperately to do something creative! So, I guess it was the will to escape my daily routine and the love of anything yarn-y that first led me to start to crochet. What are five words that best describe your art? The fact only that you call it art really honours me! Well, I guess my work can be identified as colourful, artistic, lightweight, free spirited, statement pieces. At least I want to think of them as such! What are some of your favorite items that you have made? The fact that I try to experiment a lot with different materials and shapes each time, leading to such varied final results, makes it very difficult to choose a favorite! They all have their different reasons that I love them. For example, I love my wire projects for being delicate, my silk yarn necklaces for their bohemian soul and my latest yarn bag experiments for being so new and still kind of unexplored for me! How has your work changed since you first learned to crochet? As everything in life that you put effort and love to, it evolves in unexpected ways! As time goes by, I tend to pay more attention to details. I try to combine different materials with yarn and my creative improvisations in general give a better aesthetic result as I keep working. One of the materials that you use is paper. What did you learn when crocheting with paper yarn? Any tips for someone whose never tried it before? Paper yarn is a gorgeous material with so much potential. It is beautiful for jewelry but can be used in other projects, too. Paper can have a pretty sculptural effect, because of its hardness and tendency to curl a little bit when crocheted. I think it really is worth trying it. 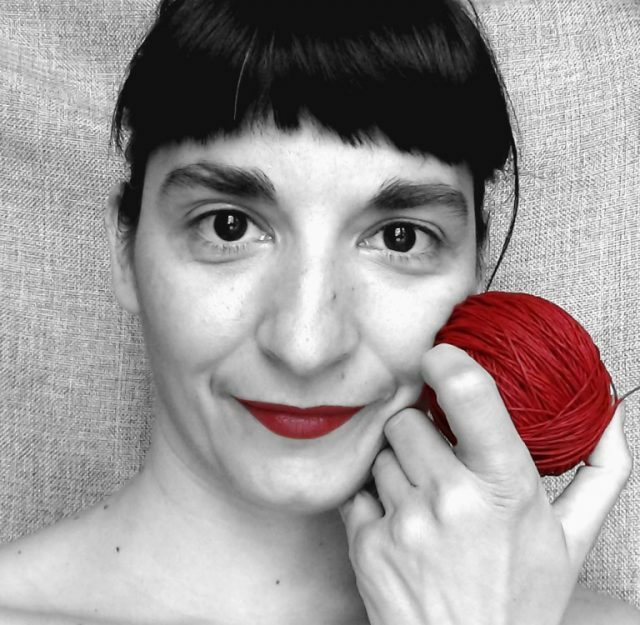 As for tips, I would say that you need to rest your fingers in between when crocheting with the bulky and strong ones and be patient, because the final result will restore your work faith! How might your architectural background influence your approach to crochet? As far as it concerns my jewellery, I think it influences the way that I deal with shapes and forms, but it also comes down to the fact that I try to be original and produce new ideas and material combinations. That’s a facet of being an architect! 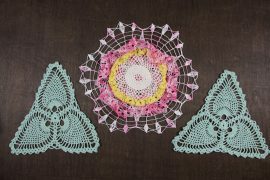 How can crochet be a good addition to home design? 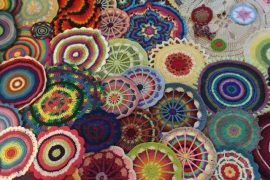 In recent years we have all seen how crochet and knitting (especially with bulky and extra chunky yarns) take their place in interior design and home decoration. I personally love this trend with neutral tones and maybe minimal interior spaces, and I think it is a widely accepted aesthetic tendency. And it is my personal goal to turn my work someday into lighting design objects and other design projects, which I love to have in my space! 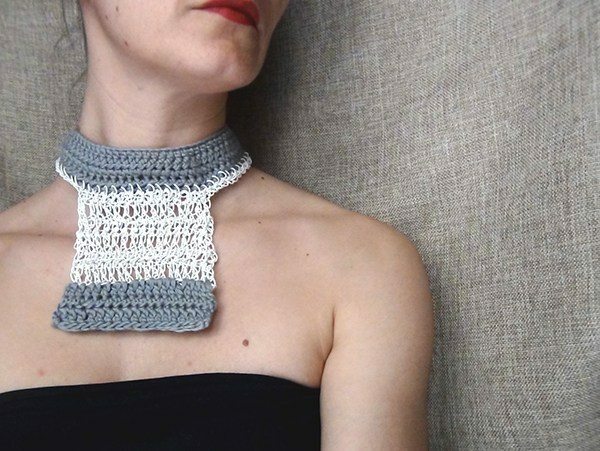 Is there a lot of support for handmade / crochet items in Greece? Not as much as I would like to see, but the truth is that in the recent years of crisis creative people have become really resourceful, organizing and collaborating with each other in promising ways! So, in the sense of the artists’ groups, I would say there is a lot of support, but we need to make more efforts in state terms of educating people to appreciate handmade creations. You sell work on Etsy. How has that experience been so far? Etsy is an amazing platform to communicate your handmade creations if you work a lot on all details of presentation, photography and SEO departments and find ways to get noticed. The only difficulty that I experience is to get found among the thousand of beautiful shops hosted there, but in spite of that I love the community of artists there (especially Etsy Greek Street Team!). 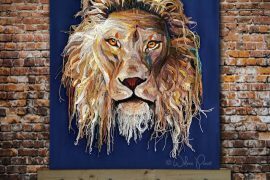 Who are some fiber artists you love? Some of my all time favourites are Dana Barnes, Jagoda Buik, Chicaru Shiota and Orly Genger, just to name a few. They are quite original and amazing! Kalo mena, Penny! What a great post! I love that you asked Penny who her favorite artists are. That’s always a great way to scope out cool artists. Thank you so much Kathryn, love the post and the photos you’ve chosen!